Manor of the Plains will hold its annual Art is Ageless® reception on March 15, 2018 from 5:30 p.m. to 7:00 p.m. Entries of artists works are from area artists who are 65 years or older. 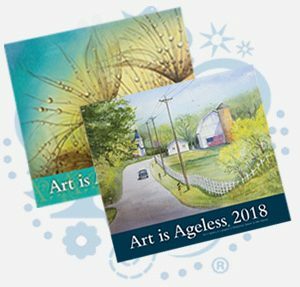 Parsons Presbyterian Manor will hold its annual Art is Ageless® reception on March 15, 2018 at 6 p.m. Entries of artists works are from area artists who are 65 years or older. Rolla Presbyterian Manor will hold its annual Art is Ageless® reception on March 22, 2018 at 6:00 p.m. Entries of artists works are from area artists who are 65 years or older. Topeka Presbyterian Manor will hold its annual Art is Ageless® reception on March 23, 2018 from 1 p.m. to 4 p.m. Entries of artists works are from area artists who are 65 years or older. Arkansas City Presbyterian Manor will hold its annual Art is Ageless® reception on March 30, 2018 at 2 p.m. Entries of artists works are from area artists who are 65 years or older. Wichita Presbyterian Manor will hold its annual Art is Ageless® reception on March 30, 2018 from 4 to 6 p.m. Entries of artists works are from area artists who are 65 years or older.